3. VW Polo | What Car? Volkswagen set a new standard in what is sure to be a CO2 race at the Geneva motor show with the very first unveiling of the day. 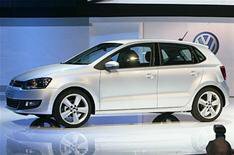 It introduced the new Polo with record low emissions for a four-seater car of just 96g/km then promptly trumped itself. Dr Ulrich Hackenberg, VW's head of technical development, announced that a Bluemotion model puffing out just 87g/km will go into production next February. This makes it even cleaner than the two-seater Smart Fortwo diesel. 'We have had to struggle for each and every gram,' he said. The car will combine a three-cylinder 75bhp 1.2-litre turbodiesel engine with engine stop-start, regenerative braking, long gear ratios, an aerodynamic package that includes lowering the car by 10mm compared with a standard Polo, and low-rolling-resistance tyres. The car will also be impressively light, like all versions of the new Polo. A concept model of the super-CO2 Polo on show at Geneva weighs just 1080 kilos. Dr Hackenberg's revelation almost took the wind out of the sails of the new Polo, which is making its world debut here. Seven engines will be available in the Polo, including a new 105bhp 1.2-litre turbo and a new 90bhp 1.6-litre diesel which, in Bluemotion form, gives the car its 96g/km CO2 figure and fuel economy of 74mpg. Prices will be announced closer to the car's launch in the autumn, but VW says the Polo will cost 212,150 euros in Germany, which equates to around 10,900. Why it's so good Record-breaking emissions results from a car that's production ready - and even better figures from a car that's set to be on sale within 12 months.